I enjoy A.H. Gabhart’s writing. She has a free and easy style that is enjoyable and perfect for a Sunday afternoon with a cup of tea and a cozy blanket! 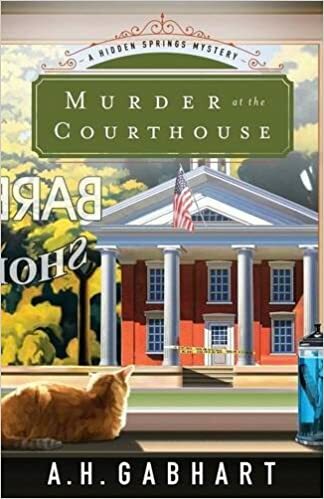 A mysterious body winds up on the courthouse steps one day and the local law enforcement is beholden to figure things out. Then the barber suddenly leaves town, a young man is acting guilty and an old mystery surfaces and there are definitely some answers that are needed. Get to know the folks in Hidden Springs, they definitely aren’t boring! A little nosy perhaps, maybe some a little meddlesome, but they mean well, really they do! Michael Keane has his hands full with this crowd and here he thought life in Hidden Springs would be quiet after his stint with the Chicago police force. Everyone has a theory. Sadly, there are a few pointing in the direction of a troubled young man. Michael doesn’t believe it but he’s keeping a close eye. With all the theories popping up, some old mysteries have risen to the surface, can they solve those, too? Come along for the ride! There are plenty of twists and turns in Gabhart’s story. I have to admit I guessed most of them but it was still a fun read, you’ll want to go visiting in Hidden Springs when you’re done! Since this is Book 1, it looks like there are more adventures coming for the people of Hidden Springs. This book was supplied by Revell, a division of Baker Publishing Group.